Master of Advanced Leadership Practice graduate Dan Walker. As a senior sales executive at global technology companies such as Samsung and Dell EMC, Dan Walker understands the career opportunities available in the digital sector. But he is also aware of the relatively small number of Māori taking advantage of those opportunities. 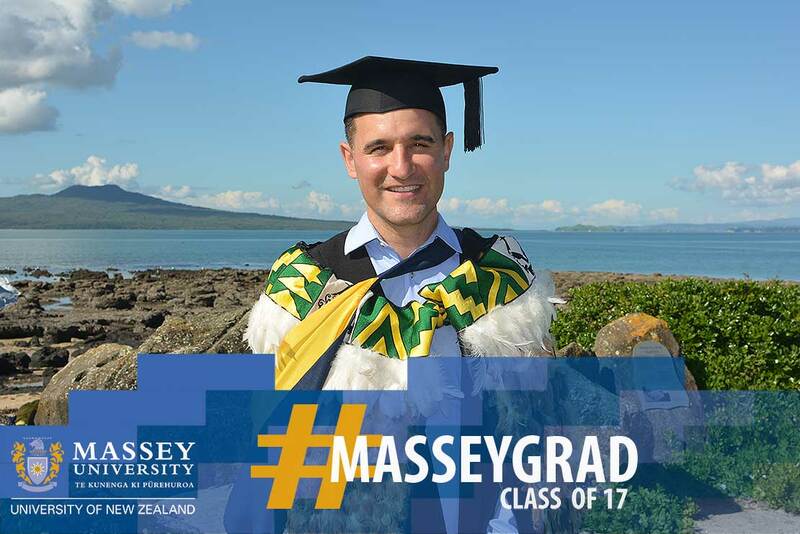 Last week Mr Walker, who is of Ngāti Ruanui descent, was among the first students to graduate from Massey University’s new Master of Advanced Leadership Practice. His master’s thesis ‘Māori Values as a Framework for Digital Leadership’ analysed the success of a digital initiative implemented by his iwi, with the aim of understanding how to encourage greater Māori participation in the technology sector. Ngāti Ruanui, Mr Walker’s South Taranaki iwi, developed its 2NuiCODE programme in 2015 to build the coding, robotics, computer programming and mobile app development skills of its young people. It was New Zealand’s first iwi owned and run digital coding initiative and he discovered that one of the keys to its success was an adherence to a tikanga Māori framework. “2NuiCODE showed that tikanga Māori was a way to get participation and trust. The parents were more likely to let their children get involved because they knew tikanga Māori was at its heart – they knew their children were going to be protected. While his iwi’s young people have an “innate digital mindset”, Mr Walker says, the majority of iwi were looking for leadership and support in harnessing the digital economy for their people. There were also concerns that the digitising of stories, images, waiata and other ancient knowledge could lead to them being misused or misappropriated. He says the participants he interviewed said the lack of tikanga in the digital world was a key reason for low Māori participation rates. Despite the preceived risks, he says the Ngāti Ruanui trust board wants the iwi to embrace digital technologies. The iwi also hopes the digital learning fostered by 2NuiCODE will allow young people to create their own technology-based jobs and remain in Taranaki. “The iwi has set up the foundations for a new stage of entrepreneurship in the digital space. Many of our iwi leaders are from legal, educational and social services backgrounds. These skills were needed to achieve our settlements, but now we need to think of the future,” Mr Walker says. He also found 2NuiCODE’s benefits went far beyond creating opportunities for employment. The young people he interviewed discussed how iwi were in danger of becoming irrelevant, especially as more and more Ngāti Ruanui move outside the tribal boundaries. The challenge is to establish these platforms using their own ground rules, based on Māori values, rather than adopting a one size fits all approach, Mr Walker says, and he believes this offers a leadership opportunity for Māori. “My research showed that the world is going to need a values industry to shape new technologies such as artificial intelligence and machine learning if we are to protect ourselves – this is well recognised. Knowledge only becomes wisdom when it is considered through a values framework. “Tikanga Māori has a lot to offer and my research shows these traditional values are still relevant in the modern world. To be at ease in the digital world, Māori need to operate using their own values and, who knows, these values may help the rest of the world as well.